Synthetic peptide corresponding to Human Proteasome 20S LMP7 aa 259-274. Our Abpromise guarantee covers the use of ab3329 in the following tested applications. WB Use a concentration of 1 - 3 µg/ml. Detects a band of approximately 20 kDa.Can be blocked with Human Proteasome 20S LMP7 peptide (ab4945). The proteasome is a multicatalytic proteinase complex which is characterized by its ability to cleave peptides with Arg, Phe, Tyr, Leu, and Glu adjacent to the leaving group at neutral or slightly basic pH. The proteasome has an ATP-dependent proteolytic activity. This subunit is involved in antigen processing to generate class I binding peptides. Replacement of PSMB5 by PSMB8 increases the capacity of the immunoproteasome to cleave model peptides after hydrophobic and basic residues. Acts as a major component of interferon gamma-induced sensitivity. Plays a key role in apoptosis via the degradation of the apoptotic inhibitor MCL1. May be involved in the inflammatory response pathway. In cancer cells, substitution of isoform 1 (E2) by isoform 2 (E1) results in immunoproteasome deficiency. Defects in PSMB8 are the cause of JMP syndrome (JMPS) [MIM:613732]; also called joint contractures muscular atrophy microcytic anemia and panniculitis-induced lipodystrophy. JBTS1 is an autoinflammatory disorder characterized by childhood onset of joint stiffness and severe contractures of the hands and feet, erythematous skin lesions with subsequent development of severe lipodystrophy, and laboratory evidence of immune dysregulation. Accompanying features include muscle weakness and atrophy, hepatosplenomegaly, and microcytic anemia. Highly expressed in immature dendritic cells (at protein level). Autocleaved. The resulting N-terminal Thr residue of the mature subunit is responsible for the nucleophile proteolytic activity. Immunocytochemistry/ Immunofluorescence analysis of HeLa cells labeling Proteasome 20S LMP7 with ab3329 at 5µg/ml. The cells were fixed with 4% paraformaldehyde for 15 minutes, permeabilized with 0.1% Triton X-100 in TBS for 10 minutes, and blocked with 3% Blocker BSA in PBS for 15 minutes at room temperature. 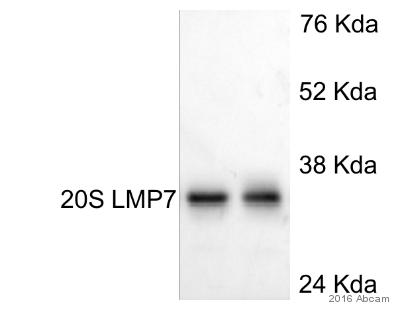 Cells were stained with or without Anti-Proteasome 20S LMP7 antibody (ab3329), at a concentration of 5µg/ml for 1 hour at room temperature, and then incubated with a Alexa Fluor® 488 goat anti-rabbit IgG secondary antibody at a dilution of 1/1000 for 1 hour s at room temperature (both panels, green). Nuclei (both panels, blue) were stained with Hoechst 33342 dye. Ab3329 staining Human normal skin. Staining is localized to cytoplasmic and nuclear compartments. Flow Cytometry analysis of SH-SY5Y cells labeling Proteasome 20S LMP7 with ab3329. Cells were fixed with 70% ethanol for 10 minutes, permeabilized with 0.25% Triton™ X-100 for 20 minutes, and blocked with 5% BSA for 30 minutes at room temperature. 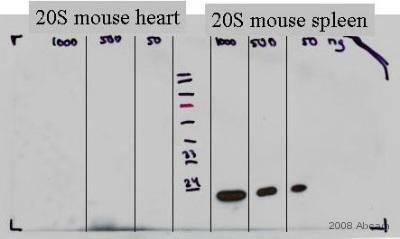 Cells were labeled with Anti-Proteasome 20S LMP7 antibody (ab3329) (red histogram) or with rabbit isotype control (pink histogram) at 3-5 ug/million cells in 2.5% BSA. After incubation at room temperature for 2 hours, the cells were labeled with Alexa Fluor® 488 Goat Anti-Rabbit Secondary Antibody at a dilution of 1/400 for 30 minutes at room temperature. The representative 10,000 cells were acquired and analyzed for each sample. 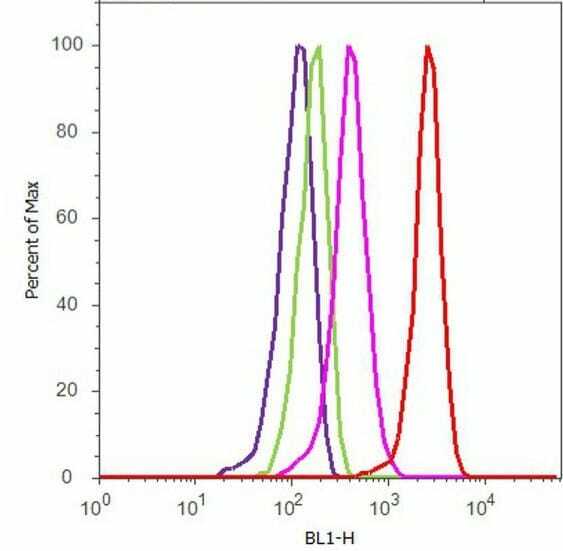 The purple histogram represents unstained control cells and the green histogram represents no-primary-antibody control. 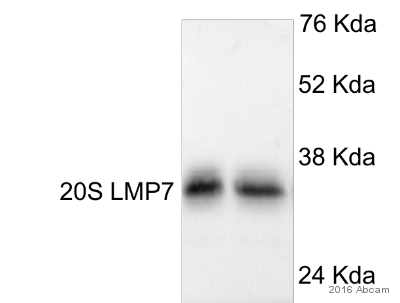 Western blot of proteasome 20S LMP7 from HeLa cell extract using ab3329. ICC/IF image of ab3329 stained MCF7 cells. The cells were 4% formaldehyde fixed (10 min) and then incubated in 1%BSA / 10% normal goat serum / 0.3M glycine in 0.1% PBS-Tween for 1h to permeabilise the cells and block non-specific protein-protein interactions. The cells were then incubated with the antibody (ab3329, 5µg/ml) overnight at +4°C. The secondary antibody (green) was Alexa Fluor® 488 goat anti-rabbit IgG (H+L) used at a 1/1000 dilution for 1h. Alexa Fluor® 594 WGA was used to label plasma membranes (red) at a 1/200 dilution for 1h. DAPI was used to stain the cell nuclei (blue) at a concentration of 1.43µM. Thank you for sending me this image. This data will be used to keep records of how our products are performing and for internal invetigation if needed. I noted that all tissue lysates that you have used have given the same non-specific signal. However I was wondering if you had tried a positive control lysate with your experiments. I ask this because according to SwissProt, in mouse tissue,this protreasome is expressed in spleen, thymus, lung, liver, heart and, at a very low level, in kidney.However it is not expressed in brain nor testis. My concern is that whilethe antibody may be recognizing non-specifically it may still be performing as there is not expression in the brain. This information is in the general annotations on this page: http://www.uniprot.org/uniprot/P28063 I would highly recommend using a control tissue lysate such as ab7937 Spleen (Mouse) Whole Cell Lysate - normal tissue ( https://www.abcam.com/Spleen-Mouse-Whole-Cell-Lysate-normal-tissue-ab7937.html). If you have any questions please do not hesitate to contact me. Thank you for taking time to send us your protocols. I am sorry to hear that this antibody is not providing satisfactory results. The details provided will enable us to investigate this case and will provide us with vital information for monitoring product quality. Having reviewed this case, I would like to offer some suggestions to help optimize the results from ab38543. Spotty/sandy looking blots are often the result of aggregates in the block or antibody. I would recommend when preparing the milk in TBST that you stir it with a stir bar for quite some time. This will help dissolve particulate matter that can stick to your blot. Filtering the milk will also remove any milk that has not dissolved. I would also suggest that you centrifuge the antibody before use and use the supernatant from the top should aggregates appear. You may use the supernatant at recommended dilutions without a reduction in quality. I would also recommend using a lower concentration for your secondary antibody. Some people have noted that rabbit secondaries used at high concentration may cause issues like this. To increase target signal, I would suggest using a higher concentration of ant- SMURF 2 antibody. This product has been used successfully at concentrations as high as 1:50. Should the suggestions not improve the results, please do let me know. In the event that a product is not functioning in the species and applications cited on the product datasheet (and the problem has been reported within 6 months of purchase), we would be pleased to provide a free of charge replacement, credit note, or refund. In regards to ab3329. I've seen that others have posted abreviews which have shown a higher non-specific band at about 66 kDa. Is this about the range of the higher band that you have reported? Do you have an image that you might send us? Would it also be possible to send me the original order number or purchase order for these products. If we need to replace them having that information will expedite the process. I hope this information is helpful, and I thank you for your cooperation. Dear Madam/Sir, We have recently purchased an antibody (20s LMP7) #ab3329 from Abcam but it does not seem to be functional. Me and my colleague have tried it with both milk and BSA blocking solution and it yields two non-specific bands much higher and lower than expected (20kDa) size. We also have purchase the Smurf1 and Smurf2 antibodies. The Smurf1 antibody works good but Smurf2 (#ab38543) antibody weakly gives the expected band but it shows also lots of sand shaped spots on the membrane and washing for long time does not solve this problem. I wonder to know if we could get replacement for these two new purchases from another batch of antibody. Thank you for considering our case. Thank you for contacting us. I would like to ask you if you might send me the protocols used with these productsso that we can gather further information regarding the samples tested and the protocol used. Once we receive your response, we will look at the protocol and see if there are any suggestions we can make that may improve the results. This information will also allow us to investigate this case internally and initiate additional testing where necessary. If the product was purchased in the last six months and is being used according to our Abpromise, we would be happy to replace or refund the antibody. For our records could you please include the following details in your protocols for each antibody? What tissue type was used? How was the tissue prepared, including lysis buffer and conditions? Were the samples denatured? How much total protein was loaded per well? What were the running and transfer conditions and buffers? Did you use a loading control? Did you usethe recommended positive controls? What were the results of those controls? What blocking reagents did you use? You have mentioned that milk and BSA were used for ab3329, what were the concentrations of these in your block? What incubation times and temperatures did you use? What concentrations did you use the primary antibody concentration at? What incubation times, temperatures and reagents did you use? What was the secondary antibody? What were the concentrations, incubation times, temperatures and reagents used with this? Were different conditions tried, including different antibody concentrations and incubation times? What wash steps did you use? Which detection system did you use? I look forward to hearing form you soon.